Whether it's Elizabeth Taylor and Rock Hudson giving birth to blonde haired children in Giant or the selection of an actor who inexplicably uses a different accent than his "relatives," in the world of film, casting can either make or break a picture. And in The Road from Coorain, the casting is so perfect that I couldn't help remarking several times that if I saw actresses Juliet Stevenson and Katherine Slattery on the street, I wouldn't have doubted that they were mother and daughter. Of course, in this true life work based on the memoir of historian Jill Ker Conway, it does take awhile for the young Jill to morph into actress Slattery for good. However, seeing the young woman sit down on a swing right from the start and begin a voice-over about her mother before director Brendan Maher moves directly to a shot of Stevenson looks like it could've been a big budget home movie edit from one age to the next for Stevenson's character, let alone an establishing shot of mother and daughter. However, unlike most home movies but far more suitable for the memoir approach, viewers are let into a large amount of scenes that most families wouldn't have wanted to preserve for the camera... unless, of course they were hoping to star in a drama filled reality series where suicide, alcoholism, death and infidelity, guilt trips and confrontations occur in ways that aren't quite as enjoyable to achieving one's Warhol promised 15 minutes of fame as appearing on Dancing with the Stars or Project Runway. 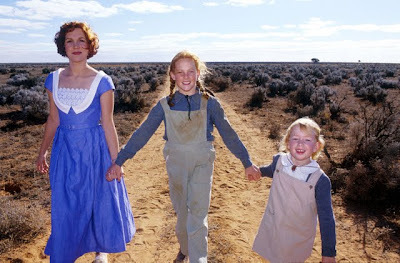 While the Australian multiple award winning 2001 television movie that aired the following two consecutive years on PBS' Masterpiece Theatre begins with the nostalgic tones of the book given to Jill with The Secret Garden, once her two older brothers head off to private school, soon it becomes much darker in spirit with twinges of Bronte thrown into the mix as the precocious girl and her headstrong feminist mother suffer one heartbreak, hardship, and headache after another. 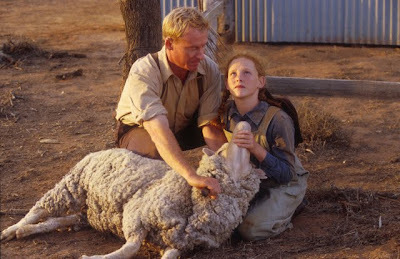 Set in the drought stricken terrain of their New South Wales sheep ranch Coorain just before the second World War where the farmers have little control over the unforgiving landscape, after the tragic death of Jill's father leaves the family reeling, her mother Eve never fully manages to recover, drinking far too often and pushing her children into taking on roles they're not quite ready for as the indebted sons take turns taking control of the fledgling ranch she refuses to sell. Working two jobs to ensure that her husband's legacy won't evaporate and taking more loans out from the bank in Sydney, after Jill uses the education she acquired simply by reading with her mother and continually excel-- breaking new ground as a female scholar of the era-- Eve begins to withdraw from her daughter's ambitions but cling tighter to her persona, wanting to ensure that she won't be left flailing in the dust of the Australian countryside. Rougher going as a film than you'd expect, The Road from Coorain is not quite as compelling nor tenderly tough as Acorn Media's recent Aussie releases like The Shiralee and Rain Shadow. Likewise, in Coorain it's unsettling when our maternal heroine the story is about gradually becomes about as appealing as Liz Taylor in Virginia Woolf as it continues because of the devastating loss of two souls she cherished, not realizing that she has more relatives including her daughter who desperately want to be cherished as well. And while Stevenson in particular is dynamic in her role, forcefully dominating anyone else sharing a scene with her, overall and just like the message that books are the most important educational material, I kept thinking that Ker Conway's story would've been far more effective in book form. For on the page, we could have had the benefit of more back-story to understand the downfall of the father and likewise to grasp the true impact that Eve had on her daughter which unfortunately doesn't come through in a truncated 97 minute running time no matter how much the two women onscreen look alike.